Click on the Slide Show Below to Navigate! Neurons that are fully differentiated (fully mature) do not divide. Neural stem cells can divide just fine. So, why don't most neurons divide? There are 3 likely reasons. First, neurons that are fully differentiated are highly specialized and can be very large. The brain responds to brain injury, by “rewiring” itself, and even reallocating lost functionality to new brain regions. Therefore, the brain has found an alternative to replacing damaged neurons. Nowhere is the “rewiring” ability of the brain more apparent than it is in the story of Cameron, a girl with half her brain. See the news clip of this amazing story at the link below. Cameron underwent a hemispherectomy procedure at Johns Hopkins Medical Center to treat extreme epilepsy. She had to teach her LEFT side of her brain, to take over the functions that the missing RIGHT hemisphere would have performed. Most notably, the ability to control the LEFT side of the body. Muscle cells that are fully differentiated (fully mature) do not divide. Why Don’t Muscle Cells Divide? The short answer is, “Nobody really knows.” These cells are large and complex and have very specific functions and a limited amount of “space”, so these may be key factors. ​​ Red blood cells do not undergo mitosis once they are fully differentiated. Fully differentiated (mature) red blood cells are specialized for one task; getting oxygen to your cells and taking carbon dioxide away from cells. Red blood cells (RBCs) are rather odd cells, because 1) They have NO nucleus; 2)They DO NOT have DNA; 3)They have NO organelles; 4)They cannot make RNA; and 5)They cannot divide! red blood cells are made from hemocytoblasts. Your bone marrow makes hemocytoblasts which are stem cells that have the ability to differentiate into any of the cellular components of the blood. They can become red blood cells, white blood cells or platelets (clotting factors) . The hemocytoblasts DO have a nucleus and do produce enzymes and proteins. When the RBCs mature and pour into blood they lose their nucleii. So, a mature RBC functions only till the enzyme and protein stock in them are exhausted. That's the reason for a short life span of RBC of about 120 days. Some Cells Divide A LOT! The cells that line the inside and outside of our bodies, divide a lot since they . The cells in the living layer at the base of the skin divide often to replenish the cells of the skin that are lost all the time. The cells that line the digestive system, particularly the intestines are also amongst the rapid dividers. In mitosis, the cell divides. Mitosis has 4 phases (prophase, metaphase, anaphase and telophase) followed by the action of cytokinesis when the one cell becomes 2. Mitosis is discussed on the MITOSIS page! In interphase, the cell is undergoing preparations for mitosis. Interphase is separated into 3 divisions; G1 (Gap1), S-Phase (DNA Synthesis), and G2 (Gap 2). In G1, the cell increases in size, doubles its cytoplasmic contents and organelles and gets checked for errors. In G1 (Gap 1) of Interphase, the cell increases in size and synthesizes mRNA and proteins in preparation for subsequent steps leading to mitosis. We can think of “G1” as a “growth 1” phase. G2 (Gap 2) of Interphase - The G2 phase is a period of rapid cell growth and protein synthesis during which the cell readies itself for mitosis. We can think of “G2” as a “growth 2” phase. Senescent – get old and eventually undergo apoptosis. The cell cycle is controlled at three checkpoints. Check Points for is essential for accurate, healthy Cell Division (Reproduction). It is essential that the daughter cells are exact duplicates of the parent cell. Mistakes in the duplication or distribution of the chromosomes lead to mutations that may be passed forward to every new cell produced from an abnormal cell. The integrity of the DNA is assessed at the G1 checkpoint. Proper chromosome duplication is assessed at the G2 checkpoint. Attachment of each kinetochore to a spindle fiber is assessed at the M checkpoint. The G1 Checkpoint - The G1 checkpoint determines whether all conditions are favorable for cell division to proceed. The cell will only pass the checkpoint if it is an appropriate size and has adequate energy reserves. At this point, the cell also checks for DNA damage. A cell that does not meet all the requirements will not progress to the S phase. If this happens, the cell has 2 options. It can HALT the cycle and attempt to remedy the problematic condition, or the cell can advance into G0 (inactive) phase and await further signals when conditions improve. All of the major checkpoint transitions in the cell cycle, is signaled by cyclins and cyclin dependent kinases (CDKs). 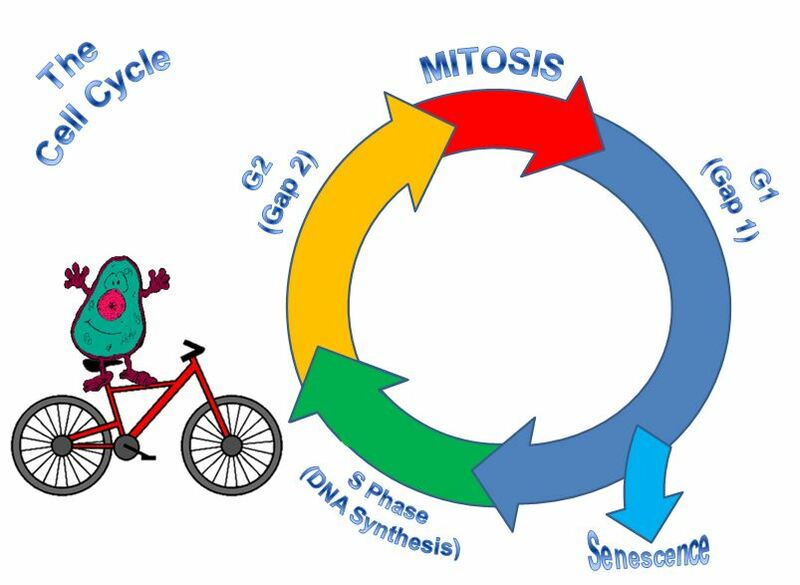 Cyclins are cell-signaling molecules that regulate the cell cycle. ​ If a cell meets the requirements for the G1 checkpoint, the cell will enter S phase and begin DNA replication. The G2 checkpoint is the most important, because it is the last check point before the cell enters MITOSIS! The G2 checkpoint checks for cell size, protein reserves and check to be sure that all of the chromosomes have been accurately replicated without mistakes or damage. If the checkpoint mechanisms detect problems with the DNA, the cell cycle is halted and the cell attempts to either complete DNA replication or repair the damaged DNA. If the DNA has been correctly replicated, cyclin dependent kinases (CDKs) signal the beginning of MITOSIS (mitotic cell division).